PBS is currently airing an intriguing new documentary about one of the largest prehistoric human burial grounds found in the Sahara. As with many of these discoveries, this one is located in the remote deserts of Niger. Over 10 years and five expeditions, Sereno has found more than 200 burial plots, each more intriguing than the last: a man buried with his head in a pot; another buried sitting in a turtle shell; a girl with a bracelet carved from hippo bone; and most striking of all, a woman embracing two children, hands entwined in a triple burial. 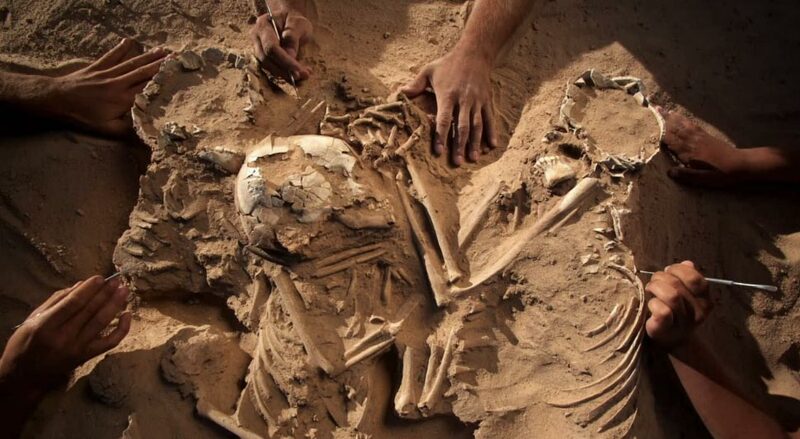 Adding to the intrigue is the fact that the bones are from two separate civilizations, Kiffian and Tenerian, thousands of years apart, yet the dead are buried side by side. Scattered throughout the site, artifacts offer clues to the lives they led – arrowheads, intricate jewelry and, perhaps most surprising of all, harpoons carved from bone. Watch the full National Geographic special here on PBS (in high definition no less). As a Peace Corps volunteer in Niger in the late 80’s, Leslie Natzke noticed that there were very few young women and girls going to school. Since then, she’s launched a non-profit aimed at developing leadership skills in young women in West Africa to empower them to become pillars in their communities. Natzke introduces us to her organization, Expanding Lives. Listen to the WBEZ Worldview interview here on SoundClound. Note: yes, the URL is correct; the WBEZ segment includes multiple stories, some of which relate to military action in Syria. The Niger story begins at the 35:00 minute mark.